FJ Hobbs and Son farm beef livestock in a small village outside Milton Keynes. However, they have become a farm of some national importance due to the way they feed and treat their animals. Using advanced techniques and bespoke strains of grass and other feed crops, they manage to produce beef that is lower in carbon. This has attracted attention from some big food and restaurant companies in the UK, keen to adopt new techniques as part of reduce carbon in their supply chains and augmenting their CSR policies. 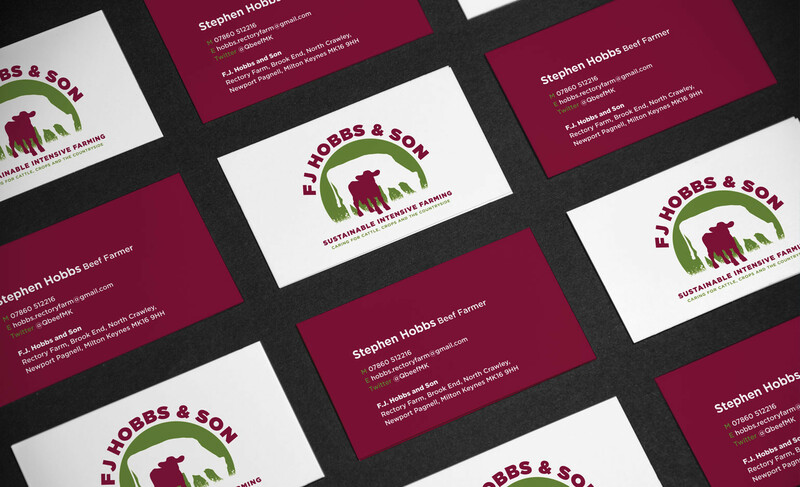 With all this attention FJ Hobbs approached us to develop a brand that would position them as a business, rather than just a farm. The logo encapsulates all that they do; good stewardship on the pasture, excellent animal husbandry and caring from the land that has been in the family for generations. The colour choices attempt to mirror the natural environment and the end product.